Positive ID Labels team have designed new best before batch labels to meet the needs of a common manufacturing problem of marking products with best before and batch information – our new Best Before Batch Label – but in miniature! The new Best Before Batch labels use a standard CT4 26mm x 12mm label which is commonly used in one line label guns. Positive ID Labels sells a range of one line label guns such as the Open C8 label gun that incorporate 8 digits in the print head and can be used to deliver this data on a small scale. It is also possible to use an Open S10 date coder to much the same effect if it is important to use a 6 digit date code. The miniature best before batch label design simply splits the coding into a left and right-hand pane. 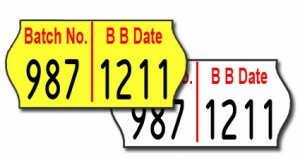 The left-hand pane incorporated the batch number of up to 4 numerical digits and the right-hand pane contains the best before date in a 4 letter format e.g. mm/yy or dd/mm. Positive ID Labels is proud to now offer this solution to all their customers, printed to order (not ex. stock unfortunately). The labels are printed on our Mark Andy presses and must be ordered in minimum quantities of 90,000 (60 rolls). The labels will work in any 2612 label gun, whether that be Swing, Open, Danro or from alternative suppliers. We recommend Swing, Danro and Open hand label guns as they are more robust and reliable than virtually any other brand. The three makes all benefit from tough plastics in their construction and can take considerable wear, tear and abuse from users. Easy to use and maintain, you can purchase label guns directly from us with your order for miniature best before batch labels.